Luwak Coffee, the rare beverage made from beans found in the droppings of the palm civet, has become a perennial topic in popular media these days, but Paul Watson of the Los Angeles Times has written an outstanding article on the coffee. 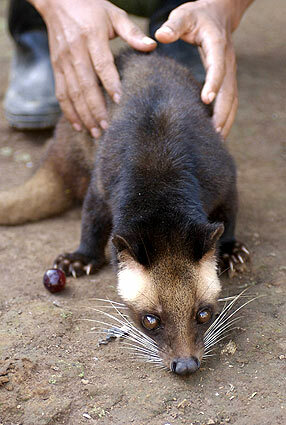 Watson highlights many of the concerns around Luwak coffee, which can fetch prices of up to $600 per pound. Human hands don’t harvest the beans that make this rare brew. They’re plucked by the sharp claws and fangs of wild civets, catlike beasts with bug eyes and weaselly noses that love their coffee fresh. They move at night, creeping along the limbs of robusta and hybrid arabusta trees, sniffing out sweet red coffee cherries and selecting only the tastiest. After chewing off the fruity exterior, they swallow the hard innards. Beyond the unusual process it takes to create the coffee, Watson also mentions the love/hate relationship coffee farmers have with this animal, which can do serious damage to many crops, not just coffee. He also mentions that civets, which can grow to over 100 pounds and are themselves fairly tasty are often killed for food. Watson quotes Canadian food scientist Massimo Marcone about the authenticity of the luwak coffee on the market and offers a description of authentic luwak coffee which echoes my review of the kopi luwak from animalcoffee.com. “About 42% of all the kopi luwaks that are presently on sale are either adulterated or complete fakes, unfortunately,” he said. Real kopi luwak has a top note of rich, dark chocolate, with secondary notes that are musty and earthy, the scientist said. An Indonesian coffee lover described the scent as the smell of moist earth after a rainfall, with hints of vanilla, that teases the palate for hours after the cup is empty. Check out Watson’s full article on the LA times website. I have never seen a more complete article about luwak coffee. hmm: If this stuff is so good, has anyone tried duplicating the results, perhaps by feeding coffee cherries to skunks? Just a thought, and perhaps a lucrative one! I have many luwaks for sale.male and female.call me at 081310000065.or 0333846074.